Combining good films and good times it’s a joy to once again collaborate with Clevedon Skate Project and be part of the increasing wave of community and charity work in the skateboard community. This one off evening will include a live hip hop band and MC, competition giveaways, a short film about the positive impact of skateboarding, and Mid 90s as the main feature. 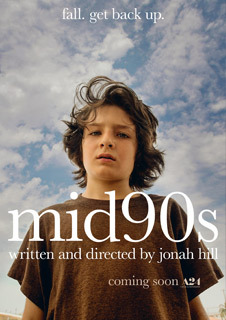 A coming-of-age comedy-drama, Mid 90s follows troubled 13 year old Stevie in 90s era Los Angeles who spends his summer between a difficult home life and a group of new friends that he meets at a skate shop. A blast of reality, humour and nostaligia for those long 90s summers this is the critically lauded directorial debut from Jonah Hill (Wolf of Wall Street, 22 Jump Street, Moneyball). The vibe of the film’s unbeatable 90s soundtrack continues in the bar after the film as Bristol’s Golden Lion Hip Hop jam group join us to keep the tunes flowing into the night. The Clevedon Skate Project are a charity who run activities and events to engage the community in the benefits that a great skatepark and pump track can do for individuals and local communities. These focus in particular on raising confidence, supporting relationships and building a community. We are currently raising money to develop the skatepark and build a pumptrack.